You are currently browsing the tag archive for the ‘winning’ tag. It’s that time of the year when the Tour de France is on. Whilst I don’t claim to know a lot about cycling, I have a lot of admiration for this great sporting event which manages to combine phenomenal feats of endurance in breathtakingly beautiful countryside. As I observe the epic of the tour, I can see three distinct categories of riders on any normal stage. They’re the stragglers, the peloton and the fearless few and I suspect that at any one time, we are in one of these three categories ourselves. You have a disagreement or there’s something that you really want at work, home or church. You do anything to get your way. Name calling, manipulation, pulling rank, bringing up the past, yelling, threatening, even intimidation. …but have you really won? I read an unusual quote from current Liverpool manager Roy Hodgson in the lead-up to last weekend’s round of matches. That sounds a lot like what many people in society do today. Hoping for a little bit of luck so that they don’t have to worry about giving their best and performing well to be successful. There’s a significant problem with this way of thinking. 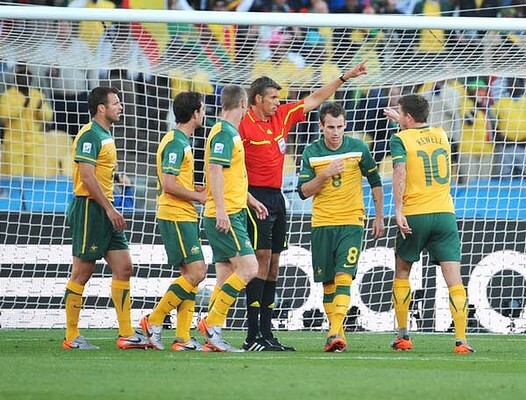 In the 2010 World Cup the Australian newspapers were full of articles about the injustices handed out to the Socceroos at the hands of the referees. Whilst there was little doubt that the Australians didn’t have much luck when it came to the refereeing decisions, to completely blame the man with the whistle for the situation is misleading and disempowering. There are times in life when decisions go against us as well and we can easily fall into the trap of blaming external circumstances for our current situation. Don’t fall for it! Here are a few key life lessons that we can learn from the Socceroos’ predicament.